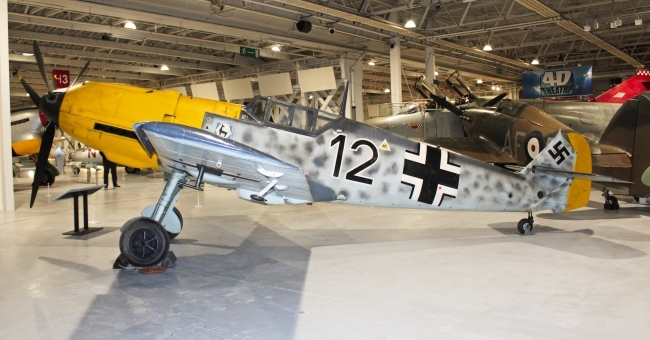 The Bf 109 was the Luftwaffe's main fighter aircraft of the late 1930s and saw combat during the Spanish Civil War as part of the Condor Legion. During World War 2 it saw action in the Battle of Britain and in the defence of Germany towards the end of the war. 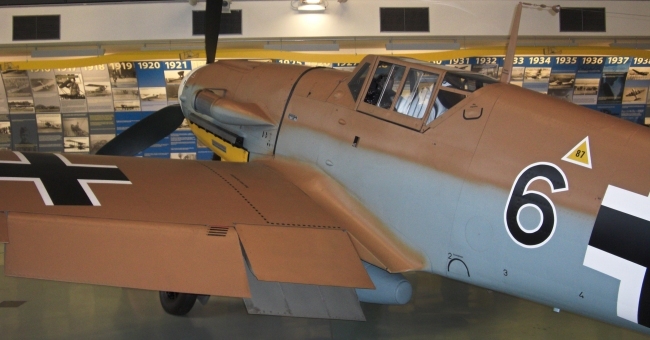 Produced throughout the war the Messerschmitt Bf 109 would appear in various guises with a number built post-war in Spain. Like a lot of Air Forces during the 1930s the Luftwaffe were using bi-planes but with monoplanes showing more potential the Reichsluftfahrtministerium issued Tactical Requirements for a Fighter Aircraft (Land) on the 6th July 1933. This called for a fighter able to fly at 248 mph, armed with a pair of machine-guns or a single cannon and able to fly for a minimum of an hour. Messerschmitt were given a development contract and during March 1934 Willy Messerschmitt and Robert Lusser began work on project Number P.1054. By May they had finished a basic mock up with January 1935 seeing a more advanced mock-up appear. This new aircraft would feature a number of ideas that had appeared on the Messerschmitt Bf 108, such as narrow track under carriage and flush-riveted stressed-skin construction. It was intended for this new type to be powered by either the 680-hp Junkers Jumo 210 or the 960-hp Daimler Benz DB 600Aa. As the Junkers engine was further along in its development this would be chosen to power the prototype. However delivery issues meant that a 695-hp Rolls Royce Kestrel VI engine would be fitted instead. The prototype known as the Bf 109 V1 made its maiden flight on the 29th May 1935 flying from Haunstetten. The second prototype made its first flight during October 1935 and was fitted with a Junkers Jumo 210A and was known as the Bf 109 V2. The following four months saw the aircraft undergo a range of tests. The next phase for the aircraft was a competition at Rechlin, home to the Luftwaffe's Flight Centre, during February and March 1936. Here the Bf 109 V2 would be up against the Arado Ar 80 V3, Focke-Wulf Fw 159 V3 and the Heinkel He 112 V4. Of the four aircraft only Heinkels and Messerschmitts would progress further with 10 prototypes of each being ordered. Eight months later during November the He 112 and Bf 109 would compete again with the Messerschmitt design coming out on top. It was the next Bf 109 prototype, the V3, which would form the basis for the A series aircraft. Although these would be built in limited numbers, with the next seven prototypes forming the basis for the B series aircraft which were the first to enter combat service. Powered by the Jumo 210D the Bf 109B-1 had a top speed of 292 mph, a range of 279 miles with a service ceiling of 29,527 ft. Armament consisted of a pair of 7.92mm MG 17 machine-guns. These would serve with the Luftwaffe's Condor Legion, which supported the Nationalists, during the Spanish Civil War (July 1936 – April 1939). 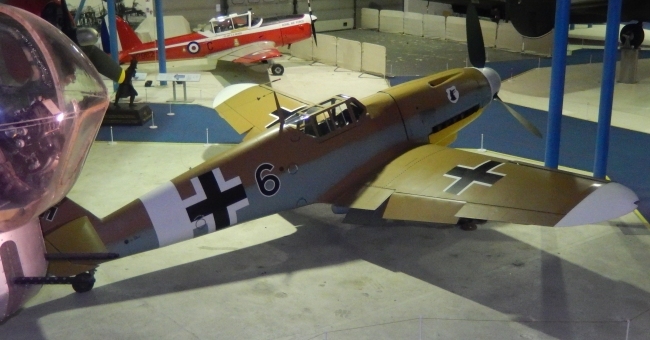 The first three Bf 109B-1s arrived in Spain on the 14th March 1937 and were soon in action. The following month on the 6th April the Bf 109 scored its first aerial victory when a Polikarpov I-15 was shot down. The B-2 was the next aircraft in the B series and this had a third 7.92mm MG 17 machine-gun added to the aircraft which fired through the propeller hub. These would also serve with the Condor Legion. 1937 would also see five of Messerschmitt's new aircraft go to Zurich, Switzerland to take part in an international flying meeting. The aircraft showed its potential winning a number of events including the dive and speed competitions. Although there was a set back when one of the aircraft flown by Ernst Udet was destroyed in a landing accident as a result of engine failure. November that year also saw a new landplane record set when on the 11th a Bf 109 V13 fitted with a 1,650-hp Daimler Benz DB 601 engine flew at 379.63 mph at Augsburg, Germany. The next variant was the Bf 109C-1 and like the A and B series this would also serve with the Condor Legion in Spain. Its top speed of 292 mph was the same as the B although it had a longer range, 405 miles. Its service ceiling was 27,560 ft and armament consisted of four 7.92mm MG 17 machine-guns. A small number of C-2s with a fifth machine-gun were also produced. 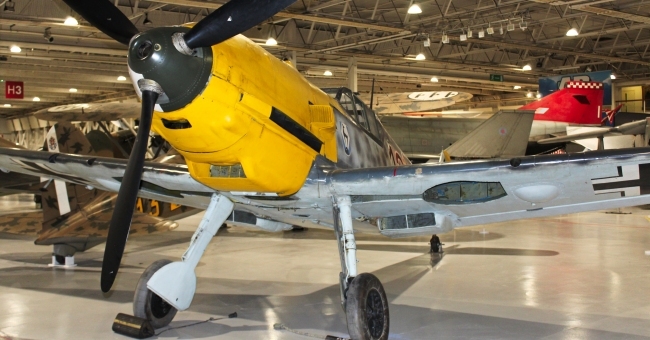 It was to be the Bf 109D 'Dora' that would be the first of the type to enter mass production. It was planned that the Jumo engine would be replaced by the Daimler Benz DB 600 engine but a lack of supply, the engine being needed for the Heinkel He 111, put paid to these plans so a Jumo 210D was used which gave the aircraft a top speed of 356 mph. These would also be used during the Spanish Civil War and would also be in Luftwaffe service when World War 2 broke out in September 1939. 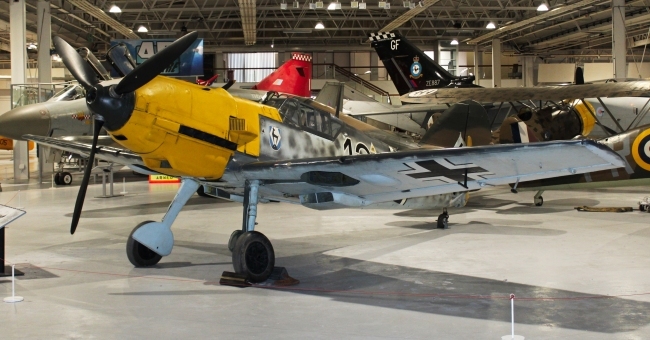 The use of the various Bf 109s during the Spanish Civil War provided combat experience to allow the design of the aircraft to be refined. The Bf 109E 'Emil' was next and would be powered by the 1,050-hp Daimler Benz DB 601 engine which gave the aircraft a top speed of 348 mph a range of 410 miles and a service ceiling of 34,450 ft. Armament would be two 7.92mm MG 17 machine-guns, two 20mm cannons and the ability to carry 550lb bombs. It was this version that would take part in the early part of the war, in fact it would be the Luftwaffe's only single seat fighter until the introduction of the Focke-Wulf Fw 190 in August 1941. It wouldn't be until the Battle of Britain that the Bf 109 came up against comparable aircraft in large numbers when it met the Royal Air Force's Supermarine Spitfire and Hawker Hurricane with all three aircraft being evenly matched. The next in the lineage was the Bf 109F 'Friedrick' which featured a re-designed airframe. Powered by the 1,350-hp Daimler Benz DB601E it had a top speed of 372 mph, a range of 400 miles with a service ceiling of 38,000 ft. Armament for the Bf 109F saw a 15mm cannon, which fired through the propeller shaft, compliment the two 7.92mm MG 17 machine-guns. The F series also comprised two reconnaissance variants. The F-5 which was armed and the F-6 which was unarmed. The Bf 109G 'Gustav' would be the last variant to be mass produced and would enter service during 1942. Fitted with a 1,475-hp Daimler Benz DB 605A engine giving the aircraft a top speed of 385 mph, a range of 373 miles and a service ceiling of 37,895 ft. Armament was one 20mm MG 151 cannon with two 13mm MG 131 machine-guns. By this time the Fw 190 was entering service in large numbers and was now the Luftwaffe's principal fighter. One more final variant would enter service and this was the Bf 109K 'Kurfurst' and with a top speed of 452 mph was the fastest variant. A proposed Bf 109T to serve aboard the Graf Zeppelin-class aircraft carriers was proposed but as these were never completed only seven navalised versions were built, whilst perhaps the most unusual version was the Bf 109Z 'Zwilling' which would see a pair of Bf 109Fs fused together side by side. 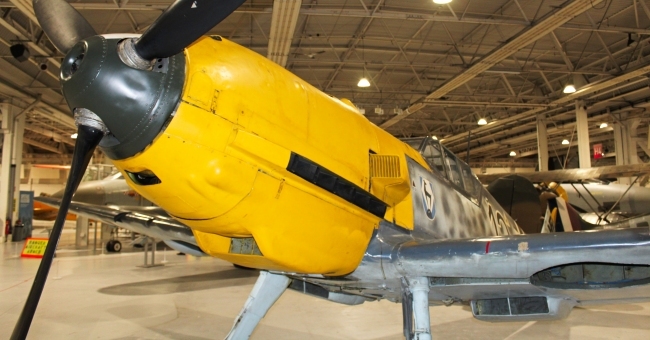 During its eight year service with the Luftwaffe the Messerschmitt Bf 109 served in many different theatres of war. Over Western Europe and the Eastern Front from Operation Barbarossa onwards with special tropical version also serving over the Western Desert. A number would also serve with the Finnish Air Force during the Continuation War (June 1941 – September 1944) and the Swiss Air Force, with at least one shot down during the war by a North American P-51 Mustang leading to red and white 'neutrality bands' added to their Bf 109s. Post war a number of licence built aircraft were produced. 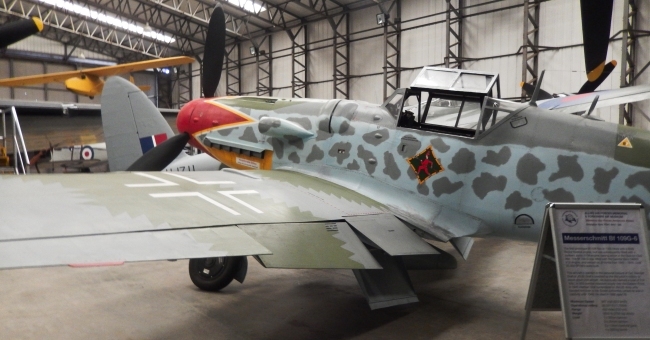 Spain built 239 examples and these were known as the Hispano Buchon and some of these would be powered by a Rolls-Royce Merlin and remained in service until 1965. Czechoslovakia also built a few examples which were known as Avia S-99 and S-199. In total 33,984 Messerschmitt Bf 109s were built. Bf 109A Only 22 built. 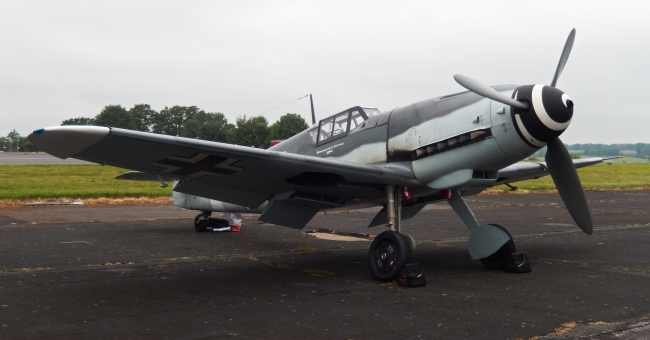 Bf 109H High altitude fighter variant with only a small number built before being cancelled. Bf 109T Intended to be used aboard the Graf Zeppelin-class aircraft carriers. Only seven T.1s were built. 63 T.2s were built but not in carrier configuration. Bf 109TL Jet powered version proposed as a back up to the Messerschmitt Me 262 in case it didn't enter service, or to be put into production as a second jet fighter. Bf 109X Two prototypes, one powered by a 1,200-hp Pratt & Whitney 'Twin Wasp' SC-G. The other by a 1,539-hp BMW 801 A-0. Bf 109Z Sole aircraft known as a 'Zwilling' which was two Bf 109Fs fused together side by side.